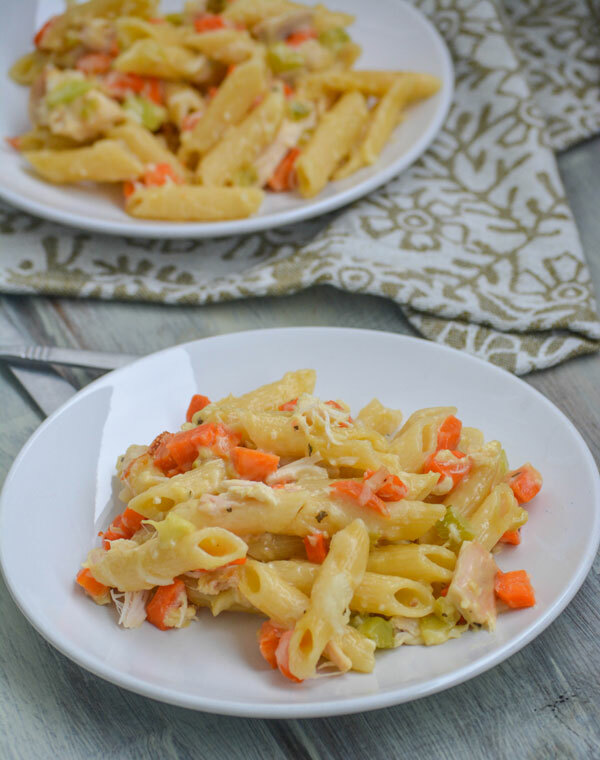 This creamy, cheesy Chicken Noodle Soup Casserole is the magical, home made (with love) cure for whatever ails you. Serve up a warm bowlful for lunch or dinner, and send your worries packin’! The flu is running rampant this year here, especially since they said the flu vaccine only worked against 10% of this years strain. Or something crazy to that affect. Seriously, it seems like everybody we talk to is sick, or is recovering, from being sick. Meanwhile, I’m over here hiding in my own home hoping the kids and I don’t catch anything yuckier that the normal Winter crud. My MIL even came home from church today, and was mildly horrified when she told us that at the beginning of Mass, the Priest announced that there’d be no passing of the cup at communion because of the ‘epidemic’. Apparently, he even ‘semi discouraged’ the holding of hands during the recitation of the Lord’s Prayer. I’m not sure which had her more upset, the fact that in her lifetime no Priest had every deviated from protocol like that, or if it was the fact that they did and it clued her into just how prevalent germs are this season! We’re extremely lucky that nobody (at least not yet) has brought anything really nasty home from school or work. Normally, I try to stay prepared. Like a head of the game with preventative measures. We buy local raw honey and everyone gets a tablespoon/day. Same with the Elderberry syrup we make. We each take a daily vitamin, and of course drink OJ for plenty of Vitamin C.
We also have our trusty, old reliable recipes on hand to ward off anything that might be lurking. A lot of them are soups. 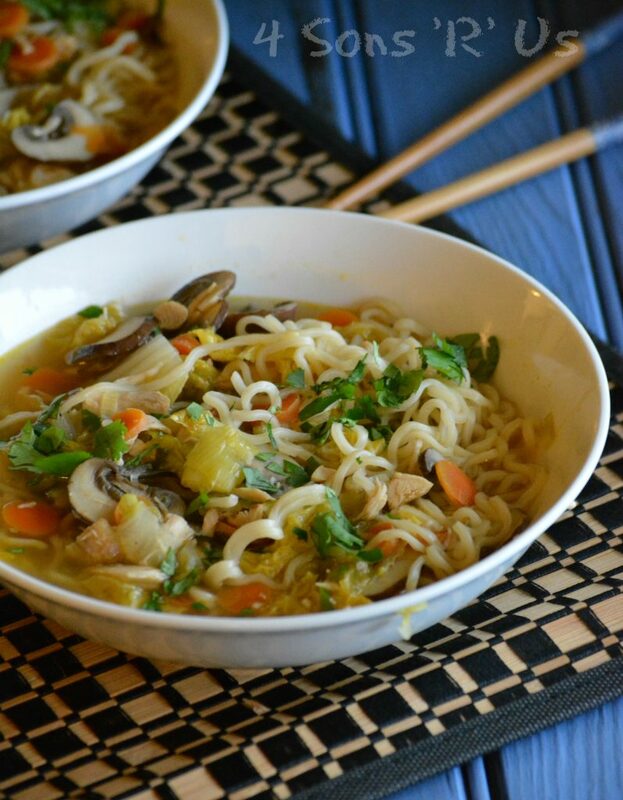 Like Warm Sausage & Kale Soup, or even this Asian Chicken Noodle Soup. 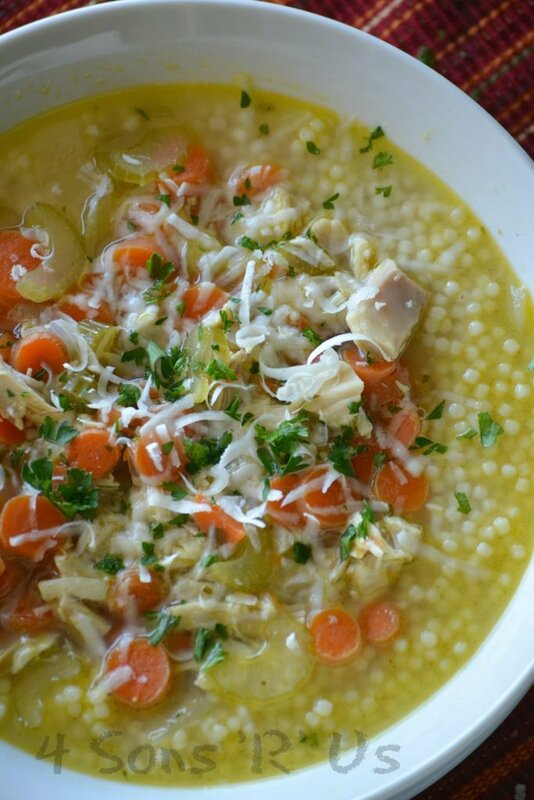 Of course, as always, there’s my Italian husband’s tried & true, beloved Italian style chicken noodle soup, too. That’s like old faithful for us, making a regular appearance. And while they all may help boost our immune systems some, dinner still has to be something we get excited for. Too much of anything, isn’t always a great thing at the supper time. The burn out can be real around here. 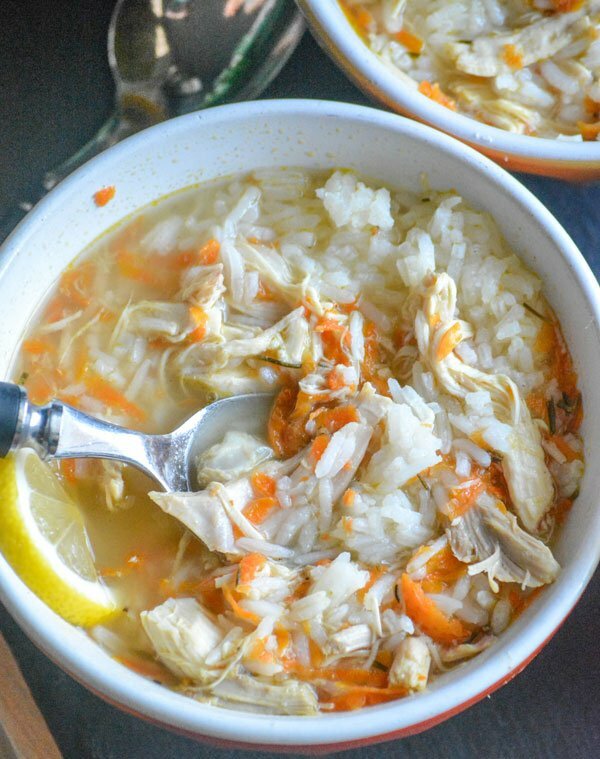 So when I came across an idea for getting those same great flavors we love during cold & flu season, but in a casserole instead of a soup- I was on a mission to make it AND love it. 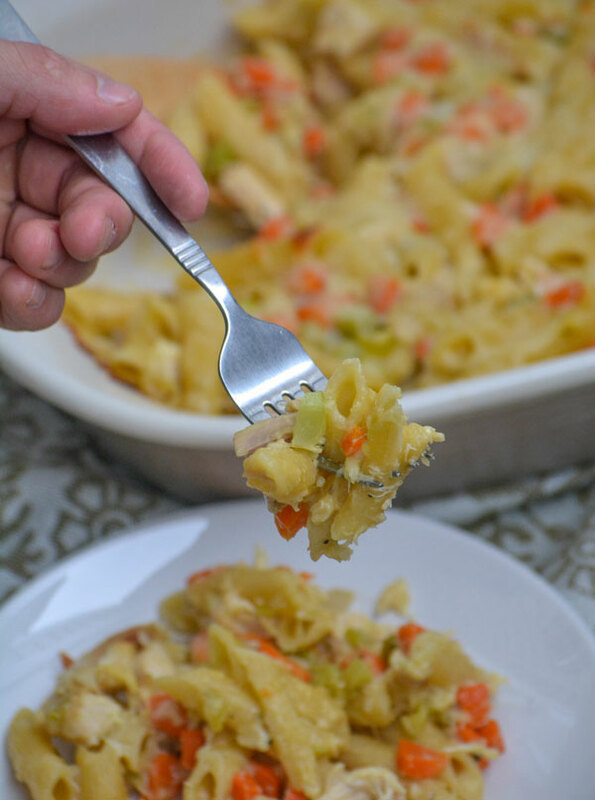 This Chicken Noodle Soup Casserole was a hit from the first time it graced our family table, and our love for it has only grown as time’s gone on. 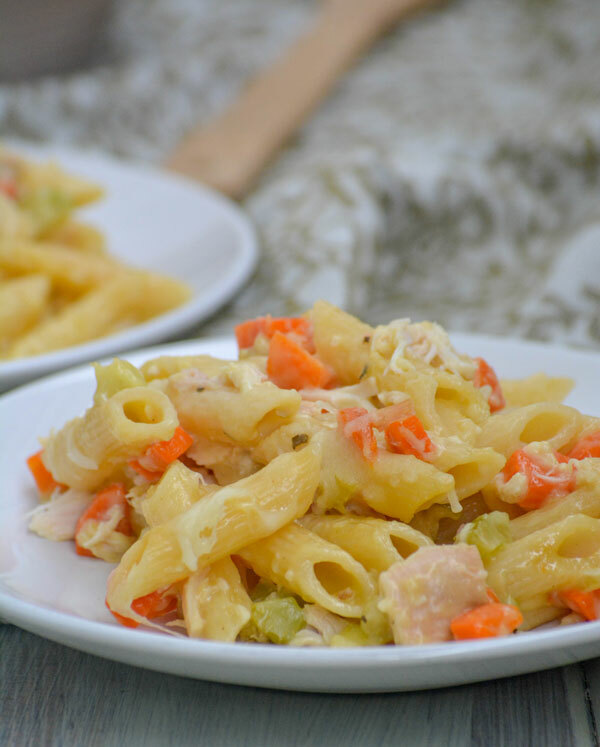 This easy Chicken Noodle Soup Casserole is a full, hearty meal in one dish. 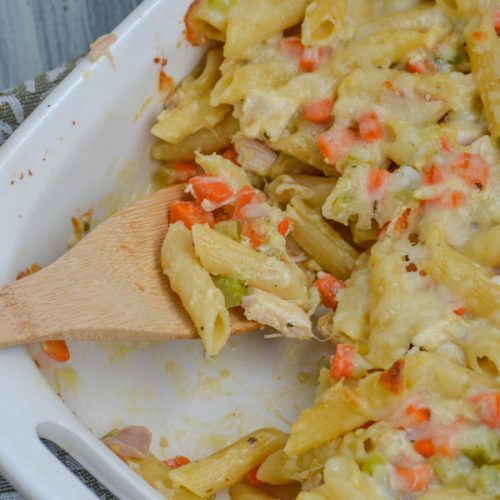 Loaded with fresh veggies, chunks of rostisserie chicken, seasonings and held together with creamy cheese- it’s a perfect dinner when the cold weather hits, or when a little cold has you feeling down. 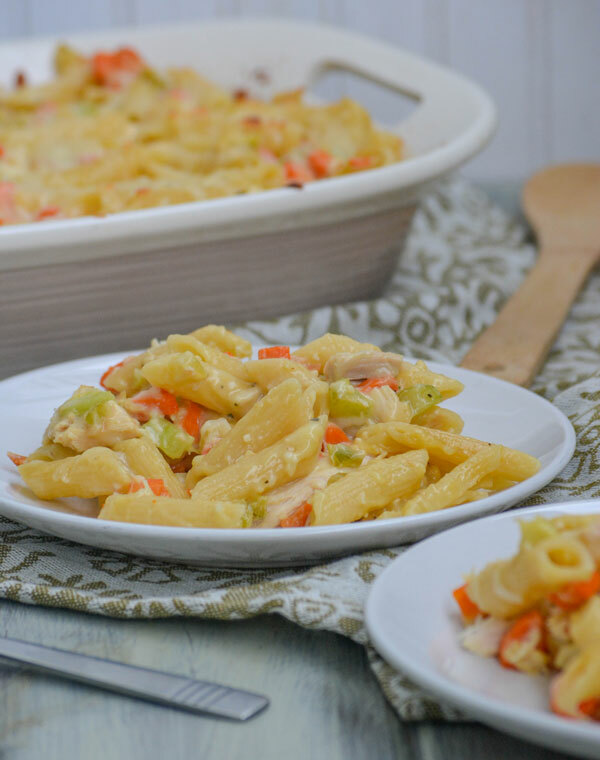 A creamy, cheesy chicken & pasta casserole that tastes just like a big old bowl full of Mama's comforting soup. In a large skillet over medium heat, melt the butter. 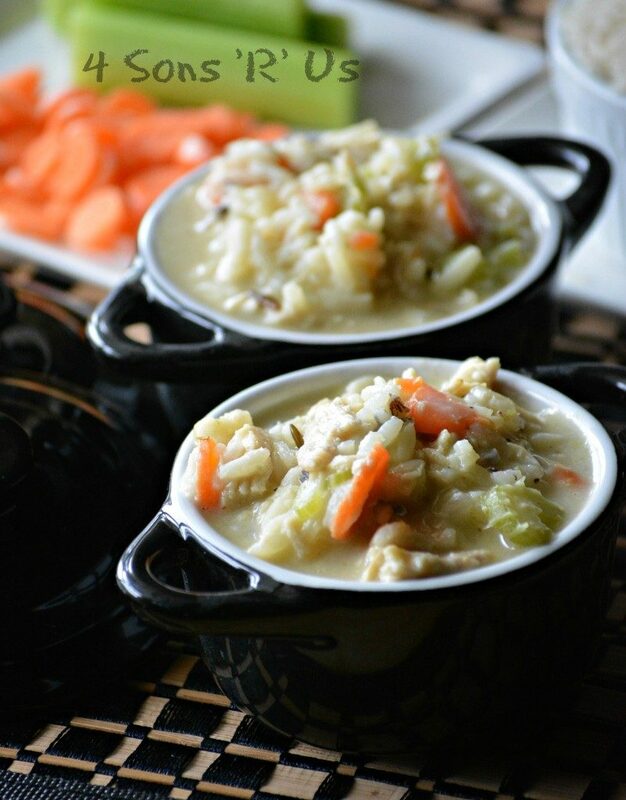 Stir in the carrots, celery, and onion, and cook stirring occasionally until tender. Stir in the garlic and saute for 30 seconds, or just until fragrant. Whisk in the flour until it's coated everything, and formed a paste-like mixture. A little bit at a time, whisk in some of the half and half until the mixture's come together and thickened. Add a bit more, repeating until it's all been evenly incorporated. Allow the mixture to simmer, 2-3 minutes, until nice and thick. 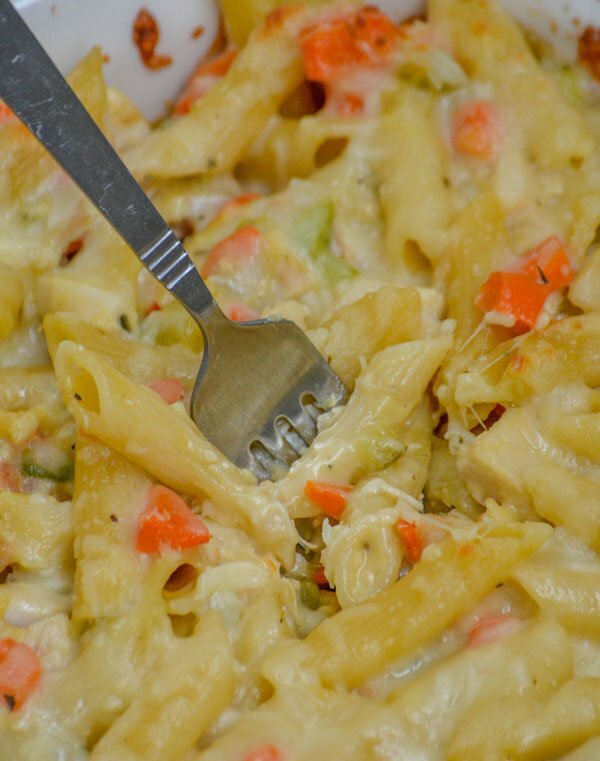 Stir in the seasonings, chicken, pasta, and mozzarella until all's evenly mixed/incorporated. Transfer the mixture into a greased 9x13" casserole dish, and spread it out evenly. Sprinkle the Parmesan evenly out over top. 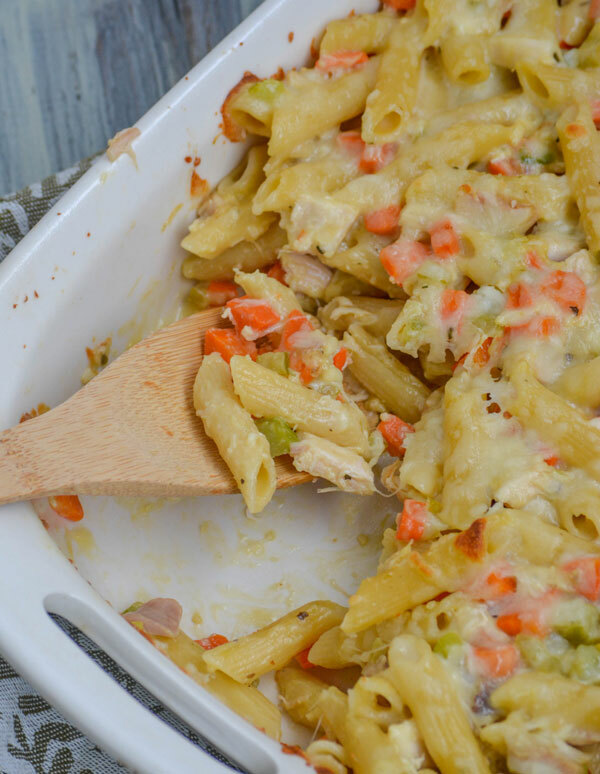 Bake the casserole at 375 for 20 minutes. Let rest 1-2 minutes before scooping and serving. It seems to have that affect on people! Ooo… I’ve put pasta in soup before but I’ve never cooked pasta actually in a broth, what a great idea! Thanks for sharing this warming dinner at Fiesta Friday. Hope you all manage to stay well. It’s seriously a game changer- so. much. flavor! So far, so good- thanks. This looks delicious! I love chicken noodle soup. Amazing recipe. Only change was I had to add a splash more half and half, maybe because of living at 7,000′. Scrumptious,will become a regular in my dinner rotation. Yep, 8 oz of noodle pasta cooked in chicken broth.